Easter is almost here, which inevitable gets me excited, as it’s practically a given right that you have to eat endless amounts of delish food. It’s the new Christmas I say. 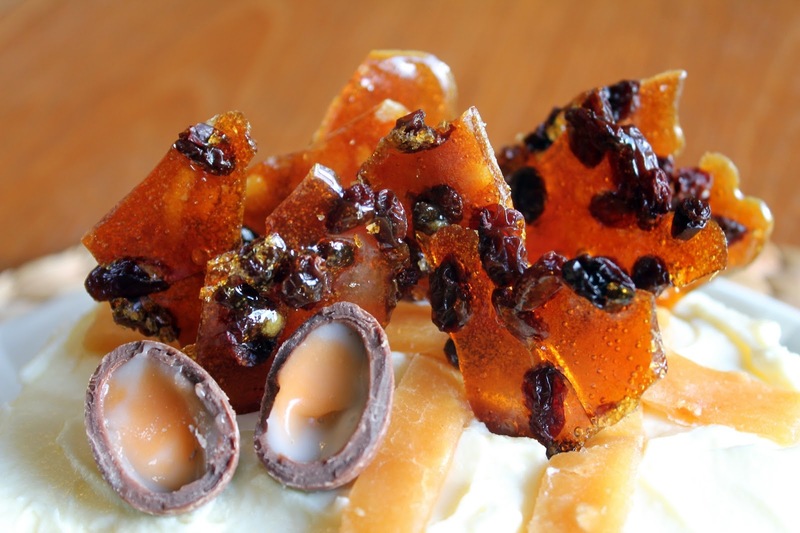 I saw Eric Lanlard’s Creme Egg brownies going around the web which got my taste buds tingling. I wanted to do something Easter themed too. So I decided to take the 2 sweet Easter food springs to mind- Hot Cross Buns and Creme Eggs and mash them together. 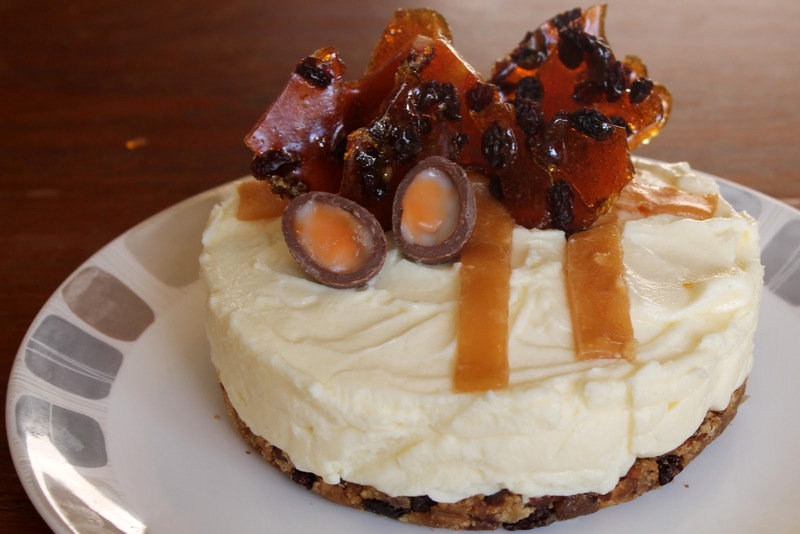 A hot cross bun crumb base, with a vanilla and creme egg cheese filling, topped with currant brittle. First to make the base, whizz up the biscuits into crumbs and set aside. Next halve and toast the hot cross buns. Then tear into small chunks. In a non stick pan, crisp up the small chunks a little more, as now the soft inside will be exposed. Add the spices and a handful of currants to the mix. Once done, add the butter until melted then stir in the bread crumbs. Pour into a spring form tin or a grease proof paper lined tin. Spread out evenly and pat until a firm base has been created and refrigerate. Using a whisk, beat together the mascarpone, soft cheese, cream and vanilla extract until thick and smooth. Using a knife, halve the creme eggs and scoop out the ‘goo’. Add to the mixture and whisk for about 5 seconds. Add the cream cheese mixture to the tin and smooth out. and refrigerate for around 3 hours. To make the brittle, line a baking tray with grease proof paper and scatter a hand full of currants on the tray. In a non stick frying pan add the sugar. Make sure the sugar is evenly distributed so it only covers a thin layer. Heat on the lowest setting and wait. DO NO STIR. Wait till the sugar is dissolved and turns a light caramel colour and is a syrup consistency. Immediately pour over the currants in a thin layer and leave to set for a round 10 minutes. To make the peanut stripes, again line a baking tray with grease proof paper. Then add the butter, sugar and peanut butter and melt and this time stirring is allowed. Once a thick syrup pour on the paper into a thin layer and refrigerate. Once the cheesecake is set, take out the peanut mixture and cut into 3 stripes and place onto the cheesecake. Break up the brittle into smallish chunks and arrange on the cake. Finally halve a creme egg for decoration. I’m not going to lie, it does sound a lot of work, and it did take a long time, but it isn’t anything too difficult. The only bit I did have trouble with. I burnt my first batch to a crisp. Make sure your pan is big, so the sugar is very thinly spread out, and as soon as it all turns golden, boom, you’re done. Decadently rich, perfect for a Easter Family dinner. Let me know what you’re doing for Easter. Oh my Good Lord this looks like heaven (and possibly a heart attack) on a plate. That looks so yummy! I'm definitely going to try that over the holidays at some point.